The Spiral Water Automatic Self Cleaning Filter is suited to applications in industrial wastewater, oil and gas, and pretreatment for desalination. 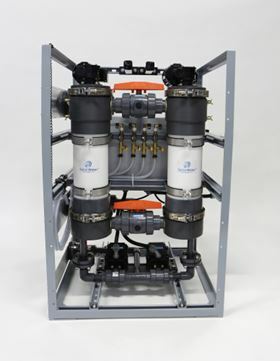 Designed for industrial wastewater, oil and gas, and pretreatment for desalination applications, the Spiral Water Automatic Self Cleaning Filter's cleaning assembly prevents the screen from being fouled by heavy solids, oil, or grease. The device won the Innovation Idol Award at the Global Water Awards in Greece in April. The companies featured in the Innovation Pavilion have been selected by BlueTech Research on the basis of the potential disruptiveness of their technologies to the market and their readiness to go. Four of the seven international water technology companies joining the pavilion have already been shortlisted for the Aquatech Innovation Award to be announced during the event on 3-6 November. Arvia Technology, from the UK, has been shortlisted for the Wastewater Treatment category for its graphite-based electro-chemical method of removing micropollutants from water. GW Fathom, from the USA, has made the shortlist in the Process Technology & Process Automation category for its geo-spatial platform that can harvest the value of advanced metering infrastructure (AMI) for utilities of all sizes. Also joining the BlueTech Innovation Pavilion are Akvola Technologies from Germany, Magpie Polymers from France, Metal Membranes from the Netherlands and US-based Aquisense Technologies. Akvola manufactures a ceramic floatation filtration device designed for hard to treat industrial effluent. Magpie Polymers has developed an innovative material to scavenge precious metals from industrial effluents. Metal Membranes has developed a method of producing ceramic membranes using plasma arc technology, while Aquisense develops UV-C LED disinfection systems. BlueTech Research is a market intelligence company, which specialises in water industry innovation and investment. Aquatech 2015 will be the first time the company has hosted its own pavilion at the biennial event.